Explore Fraser Island for the adventure of a lifetime on the world's largest sand island! Swim in Lake Birrabeen and Champagne Pools! Looking for a Whitsundays combo deal including this tour? 3 Day Nomads Fraser Island Tag-Along Tour departs from Noosa and will take you on a fantastic trip where the journey is just as exciting as the destination! This tour includes accommodation on Fraser Island, meals, an experienced guide, 4WD vehicle hire, return ferry transfer and amazing destinations! Enjoy bush walks, swimming and stunning views as you wind your way across Fraser Island, making memories to last a lifetime. The tour departs and returns to beautiful Noosa Heads and includes 2 nights in a 4-share tent or 6-share dorm room at the Eurong Resort on Fraser Island. Exclusive post-tour party at KB's Bar! 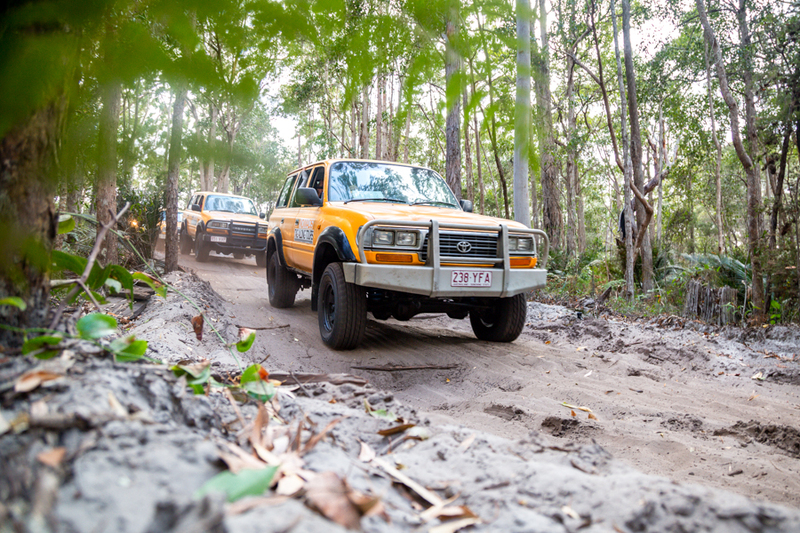 Get set to see more of Fraser Island than what you thought possible during your action-packed 3 day tag-along tour. Nomads' tag-along tour is a thrilling experience ideal for those craving adventures and fun! Join a convoy of Nomads 4WDs and make your way around the island, taking the opportunity to drive on the sand island for yourself. You will follow your lead car from place to place, exploring one beautiful destination after another. This is the opportunity of a lifetime for those who want to experience something totally new and thrilling! For your 2 nights on Fraser Island, you will stay at Eurong Beach Resort on the east coast, where you can relax and rewind after busy days of exploring! You will have access to all the resorts added perks, such as shops and a pool for the ultimate in relaxation as you hang out with your travel mates and enjoy the evenings! Guests will stay in a 6-share dorm-style room with ensuite bathroom or in a 4-share safari-style tent and have everything they need for a good nights' sleep on one of the most beautiful islands in the world, including camping mattress, pillow, light and powerpoint. Eli Creek - Float down this freshwater creek for a relaxing experience! The Maheno Shipwreck - Snap some photos at Fraser's famous shipwreck! Lake Birrabeen - Go for a swim in this beautiful, clear lake! Rise bright and early to meet at 6:45am for your departure at 7:00am and head towards Rainbow Beach. Please ensure you have checked out of your room and have both your Fraser luggage and your main luggage with you. The first stop will be at Rainbow Beach to inspect and collect the vehicles and sign rental agreements. Here guests are asked to pay a $250 cash bond or you can pay $10 non-refundable excess reduction fee to secure their spot on a 4WD. Afterwards, everyone will head out to collect food and supplies before making your way to the island from Inskip Point. The barge lands at Hook Point on the Southern tip of Fraser Island, where the driving begins! Depending on the weather and the tide your guide will assess whether it is safe to travel on the beach or if we need to select an alternative route to our next destination - The Southern Lakes. We first stop at Lake Boomanjin for a swim and a walk, then continue on to Lake Birrabeen where we have our lunch (wraps and salad). After a relaxing break, it is time for a rainforest track to walk off our lunch and explore the Island's unique flora and hopefully spot some wildlife too! We then drive to Central Station on the way to Eurong Resort arriving at around 5:30pm. After a refreshing shower, it's dinner time. You will spend the evening at Eurong Resort in a 6-share ensuite dorm or one of Nomads' 4-share tents and getting to know your fellow travellers, relaxing and taking in the sights. Day 2 begins with another early start to make most of your time on the Island! After breakfast (continental style breakfast - cereal, toasts, spread, tea & coffee), drive across to Eli Creek, the largest freshwater creek on the Eastern Coast of the Island. The creek carves its way through the island all the way to the beach and pours 8 million litres of water a day into the Pacific Ocean! There are a number of walkways and a short circular route that runs up one side of the creek and down the other. Take the opportunity to go for a float down the creek's lazy current, coming out on the sandy beach below! Next, you will cruise up the beach as you head to the famous Maheno Shipwreck, claimed during a cyclone in 1935 the Maneno wreck now sits on the shores of Fraser Island. A popular place to grab some photos and get a close up look at one of Fraser's most iconic stops. Next up is the Pinnacles, a natural wonder of Fraser Island made up of multicoloured sand cliffs. Stop here for lunch (sandwiches, salads) and a break before driving up to Indian Heads, a large rocky headland, known for its great for shark spotting! Finally, you'll head to the Champagne Pools, a unique swimming hole with ocean waves crashing over the rocks into these shallow sandy pools, creating natural rock pools. After an action-packed day, we head back to our accommodation at Eurong Resort for dinner. After a continental style breakfast, guests will travel to Lake Wabby, the deepest lake on the Island (11.4 m) and Lake McKenzie, famous for its clear blue water and sandy beaches, covering more than 150 hectares and five meters in depth. Both lakes offer a great place to swim and relax! After spending some time here and enjoying lunch, it is time to make your way back to the mainland. Depart the Island at approximately 2:30pm, stopping at Rainbow Beach to drop off our vehicles and collect bonds before driving back to Noosa. The bus arrives back around 5:00pm - just in time for the exclusive post-tour party at KB's. Passengers wishing to drive must be a minimum of 21yrs of age and hold a valid drivers licence ( minimum 2 years driving experience necessary). Please be ready at Nomads reception by 6:45am in the morning of the departure to the Island. If you miss the bus you will miss the tour. Make sure you have checked out of your room and have your luggage with you. A $250 pp refundable cash bond will be collected at Rainbow Beach ( credit card imprint for all drivers) prior to the departure, provided the vehicle has been returned undamaged. Make sure you have cash with you as there is no ATM's to use in Rainbow Beach. Alternatively you can pay non-refundable $10 excess reduction fee instead. Pack a small backpack with your camera, a valid current drivers licence (for those who want to drive), your sunscreen, insect repellent, a hat, appropriate clothing, toiletries, a sleeping bag (also available for hire) and BYO alcohol and snacks. Please note you cannot bring your own alcohol to the island. Guests are welcome to bring along their own inflatable tubes for Eli Creek as they are not provided. $250 per person fully refundable cash bond to be collected in Rainbow Beach on the way to the Island ( drivers - credit card imprint). The bond will be fully refunded provided the vehicle has been returned undamaged. Please ensure you have $200 in cash as there is no ATM available at Rainbow Beach. Alternatively you can pay $10 non-refundable excess reduction fee instead. All guests must pay this fee, even if they are not driving. Itinerary is subject to weather and tidal conditions and may be altered at operator's discretion at any time. Changes permitted up to 72 hours prior departure. Itinerary subject to change due to tidal and weather conditions. Please be aware operators pass on credit card merchant fees so there is a non-refundable 2.5% surcharge for VISA and MASTERCARD purchases. Changes permitted up to 72 hours prior to the compulsory pre-tour briefing. All cancellations made result in 25% cancellation fee of the recommended retail price (RRP), not discounted or sale prices. Any cancellations made 60-30 days prior to travel will result in a 50% cancellation fee and any cancellations made inside of 30 days to departure will result in forfeit of full trip fees. If the tour operator has to cancel the trip (prior to departure) and we cannot offer a suitable alternative, then a refund will be given minus card fees. We strongly recommend that you have travel insurance, especially during the wet season. Thank you for booking with Fraser Tours & Mr Travel. If you would like any advice or assistance in arranging accommodation, transfers or additional tours, please do not hesitate to contact us. "Amazing experience, best trip we have done in Australia! Fraser Island is beautiful, and even though there was a king tide and cyclone it was still worth every penny. Our guide ‘Charge’ was truely an unbelievable guy and made the trip the best it could of been with all his knowledge and enthusiasm. We travelled as a couple and were a little nervous at first, but we made so many friends and it was so much fun! Wish we could do it all again. Highly recommend."